Unique Styling. Superb Assembly. Sportscar Handling. As a Mini Cooper driver, you know your little car comes equipped with all these details-along with superior headroom! As part of the BMW family, you also know your distinctive Mini is well designed with precision engineering in the inside and out. At Baldwin’s German Autowerks, our Factory Level Trained Technicians ensure your Mini Cooper keeps its smooth charisma and charm on the road for all its auto repair and maintenance service needs. 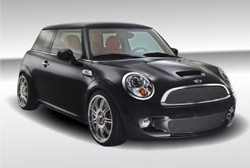 Our professional mechanics recognize the unique details of your Mini Cooper and have all the knowledge, top-of-the-line tools, and technology as the dealerships to service and handle all auto repair and maintenance needs for your Mini. Located conveniently by surrounding towns of Novato, CA, including Marin County, Baldwin’s German Autowerks is just a quick drive for all your Mini Cooper’s auto repair and maintenance needs.